Now that the "New Game Plus" context has been confirmed, this episode's preview including beach scenes made me worry that Episode 3 was going to be a 'filler' episode full of fan service and not much plot. These expectations quickly vanished during the full episode, where we see the beginning of Marie's desire to grow as a person despite her memory loss. Partnered with the ever wonderful cast of Persona 4 and "I Have Amnesia, Is It So Bad?" ends feeling like the most significant episode we've seen so far, full of many great moments that are both touching and humourous that Persona 4 fans won't want to miss. 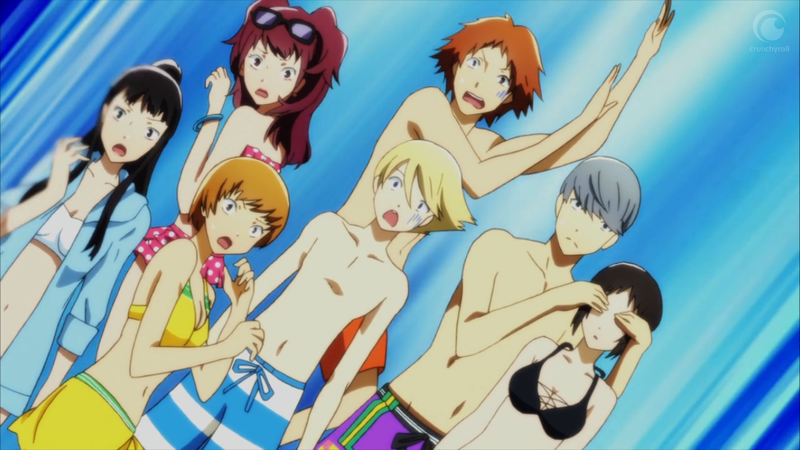 After Marie's poetry scene (which I'm assuming there will be a new one each episode) and the opening, the Persona 4 gang suggests going to the beach and bringing Marie along for the trip. Like when Marie appeared inside the TV in the first episode of the animation, Marie has been inserted into the beach scenario from Persona 4 Golden the game for the purpose of developing her character and showing Persona 4 Golden's special events simultaneously. 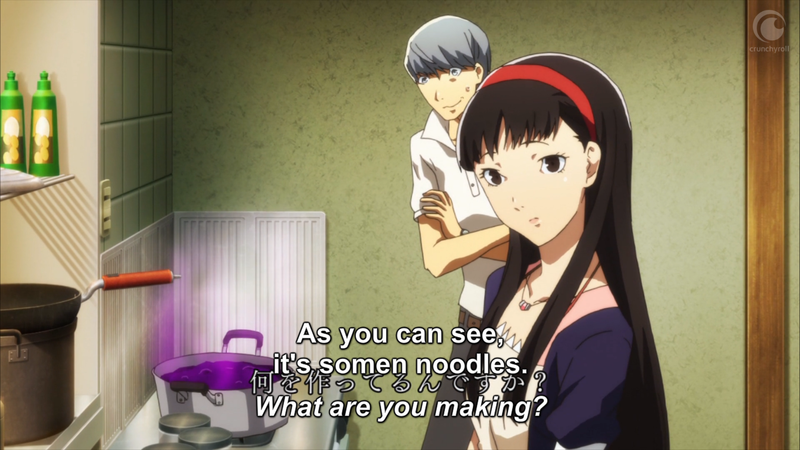 Some fans may not enjoy the inconsistency between these scenes in the game and in the anime, but considering this is an anime and requires a lot more screen time than your average social link in Persona 4 Golden, it's understandable Marie has to be put into scenarios she wasn't in before as she requires more character development than the rest of the characters. I also can't help but think the beach scenario was probably considered as a prime opportunity to get some Marie fan service in, but hey, I don't see anyone complaining. 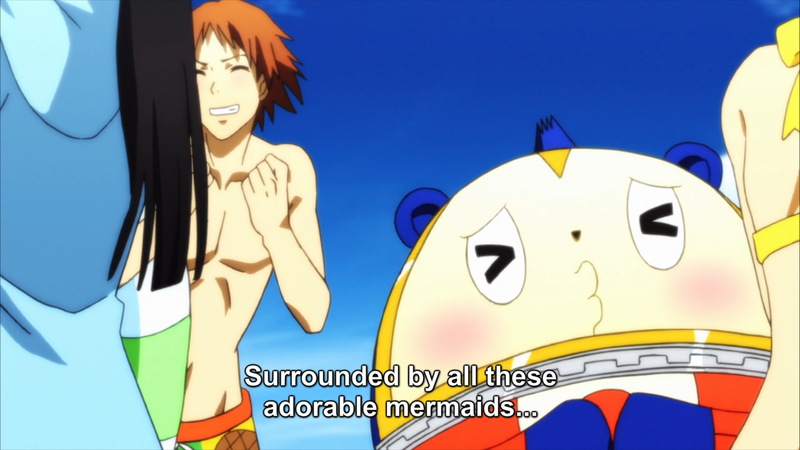 The beach offers opportunities more than just fan service by including some comical scenes and some actual plot development. My personal favourite scene from the beach scenario this time was the hilarious scenario involving Kanji and "the birth of Venus". I love that during these scenarios the Persona 4 group always stick together to try and help each other out, even if there's no getting out of the problem. 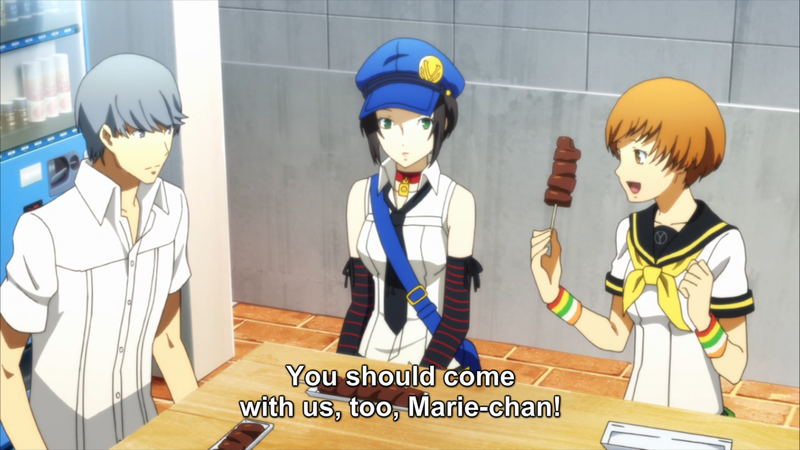 Marie's presence adds the opportunity for some character development, with the other character's natural curiosity to her becoming daunting due to her memory loss. This causes Marie to question her normality and while Marie's reactions in this scenario probably weren't the most mature, they needed to be done to kick off her personal growth. But the highlight of this episode is really Marie posing the question to each of the main characters of Persona 4 what it's like to have faced themselves. Facing yourself is at the heart of Persona 4 and the scenes involving Marie asking the cast questions on this provide some humourous moments that are very typical to each character. More importantly, we see some heartfelt lines that really portray the different kinds of strength in each character perfectly. This scene is a great reminder for fans about why the Persona 4 series is special and will also be good for fans of the anime as it shows how the last series' events have helped them grow into the happy and strong characters we see this time around. Partnered with fire crackers, smiles and laughter, it truly is this season's most heartwarming moments so far and is probably my favourite scene from both of the Persona 4 Animation series. Notably, I found the animation in this episode to be much more consistent in quality than the last few episodes, which was much appreciated. I was very happy to be focused more on the actual story this time around than distracted by the shows production! With Marie's growth evident in the last few moments of the show, the promise of finding her memories feels as though it is the true start to the series. After a touching episode. Persona 4 the Golden Animation ends with Episode 3 feeling like it's finished it's preparations and is ready to hit us with Golden's true plot properly in the next few episodes. I'm excited for the next one! This series has managed to improve episode by episode so far, with this one providing a wonderful balance of humourous and heartwarming scenes. Episode 3 of Persona 4 The Golden Animation is available now to members of Crunchyroll's Anime Streaming Service. If you're not a member, you can either wait less than 12 hours to watch the "The Perfect Plan" or purchase an ad-free monthly membership. Persona 4 The Golden Animation is also available to stream via Aniplex, Hulu and Daisuki. Want to share your opinion? Comment below! Or you can tweet @JRPGJungle or email jrpgjungle@gmail.com with your thoughts or constructive criticism.